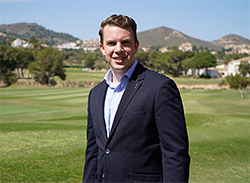 Menear took up his new position in Murcia, south-east Spain, earlier this month and will be responsible for overseeing the resort’s key international supplier markets, including the UK and Ireland. Set in a privileged corner of Murcia and three times the size of Monaco, La Manga Club is hugely popular with golfers from the UK, Europe and beyond, with its extensive facilities including three 18-hole golf courses, a nine-hole, par-47 academy course and first-class golf training centre. The resort has enjoyed an outstanding last 12 months and, as well as being voted ‘Europe’s Leading Sports Resort’ for the first time at the 2018 World Travel Awards, it has been named as ‘Europe’s Best Golf Venue’ at the World Golf Awards for the last two years running. Also the official overseas training base of the Lawn Tennis Association (LTA), La Manga Club’s unrivalled other facilities include a 28-court tennis centre, a recently-opened European Cricket Performance Centre and a 2,000sqm Wellness Centre. The resort is host to Spain’s only official Chelsea FC Foundation Soccer School while, in addition, it features the choice of a five-star hotel, four-star serviced apartments and townhouses and more than 15 bars and restaurants.